Meet Sheila, Carole and Janice – they’re quite some trio and they’re all chums. 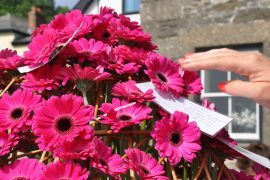 Carole started volunteering four years ago when she moved to Tintagel from Bodmin and wanted to meet people. Janice has been helping for two years having heard the former shop manager, Justine Cook at a WI talk. 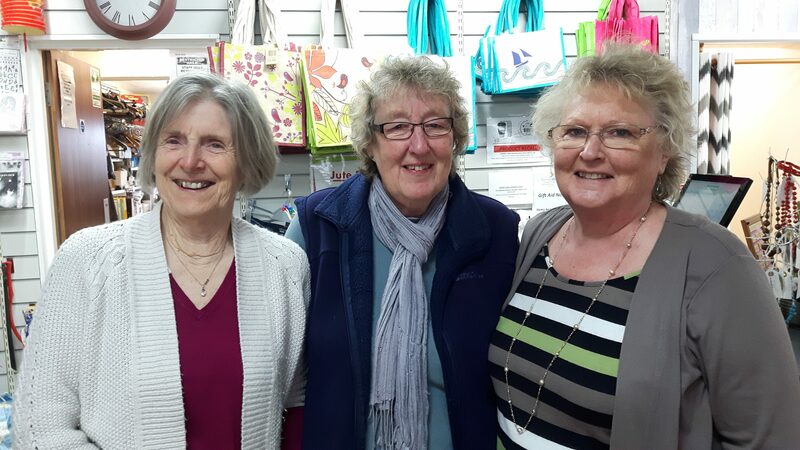 Such is their friendship that Carole is now joining Janice’s WI group in Boscastle. Sheila meanwhile, has volunteered since the shop opened and says doing an unpaid job is liberating, “you don’t have to worry about the days you can’t make it in or about having to take time off for appointments.” I love their enthusiasm and know this is going to be a good day. My ‘boss’ is shop manager, Verity Perkins who is quite simply a whirlwind of activity. She first worked in a charity shop at 16 when her Mum was manager of a Red Cross store and needed help. “She bribed me by offering to cook my favourite meal if I gave her a hand.” Now she moves around the shop completing a range of tasks and keeping me busy. There’s a knock at the back door and a caller arrives with boxes of donated goods. Verity knows the person and that they aren’t eligible for Gift Aid so thanks are offered and we race to get the boxes out of the rain. Later I’ll sort the contents, finding a range of red glass ware, a stamp collector’s book, cups, saucers and plates. This is what keeps the charity’s shops ticking along. Listening to the noise and chatter of the busy shop floor, I settle in to sorting and cleaning bric-a-brac, finding a Mother’s Day plate, three elegant statues, two sheep holding a tea light and a rather odd looking dragon that someone will love, though I’m not sure why. Once clean Verity prices the items and puts them on a shelf ready to go out to the shop at the appropriate moment. It’s all very organised and it has to be given the tiny working space ‘out back’. “We’d love a bigger shop” Verity says at one stage as she squeezes past me. Verity seamlessly steams, sorts, answers emails and makes phone calls, one to a volunteer who remarkably takes all donated puzzles home, makes them up to check all the pieces are there and then returns them. It’s a hive of industry and efficient, which is good news because the busy tourist season is nearly here as proved by the cry from the shop front of “coach” as one trundles down the main street past the shop, full of potential customers on a day out to Tintagel. Inspired by Tintagel’s friendly volunteers? Find out how you can donate some time to our charity.